Now that Realmuto has been traded (seems like that was inevitable for the last several months), I want to highlight a couple players that may or may not be prospect eligible in your league (all dependent on your league limit requirements) that could be a late round rookie pick steal or they could just be a late round bargain bin find. Then I highlight some other Baby Marlins (under 22) who have a shot to crack the top 50 in the near future. Pablo Lopez, RHP, Age: 22 – Last year in the minors he had a 1.44 ERA, 0.93 WHIP, 66 strikeouts in 62.1 innings holding opposing hitters to a .196 batting average against. His major league debut was not as efficient but he did pitch 58.2 innings and had a 1.26 WHIP. He’s most likely not MiLB eligible in most leagues with those 58.2 IP. He should open the season in the rotation with high upside. Peter O’Brien, 1B, Age: 28 — He has power for days but there is a lot of swing in miss to his game. The Marlins have signed Neil Walker but O’Brien should still get a fair amount of starts 1B/DH for Miami. If he can get off on a hot strike he could hold that position for the season. He could be MiLB eligible in your league as he has 140 career MLB at bats. Some leagues use the standard 130 but others may use 150, so check your league’s rules and roster eligibility settings. #Marlins‘ Mike Hill said the plan is to pair Neil Walker with Peter O’Brien at first base but knows Walker can be used at second, third and in the outfield. ETA for all the below is 2-3 years minimum. Matt Givin, RHP, Age: 19 — Round 20 pick in the 2017 draft has a small sample size before having TJ surgery in April last year. He pitched 7 games, all starts, with a 0.39 ERA, and a 0.94 WHIP with 19 SO in 23.1 IP. One to keep an eye on to see how his recovery goes. Dakota Bennett, LHP, Age: 19 — Round 11 pick in the 2017 draft logged 46.1 innings last year with 46 K’s and a 2.91 ERA. Opposing batters hit .274 against him causing a 1.38 WHIP. If he can work on giving up hits he should bounce back nicely and be an option for the top 50 list. George Soriano, RHP, Age: 19 — After missing 2017 with some type of unconfirmable injury he came back in 2018 to pitch to a 1.91 ERA in 42.1 innings with 36 K’s and a 0.87 WHIP. Granted it was a repeat of rookie league but let’s see how he starts off 2019. Ynmanol Marinez, SS/3B, Age: 17 — Playing as a 17-year-old in rookie ball has many disadvantages but a fantastic opportunity nonetheless. He had 263 AB’s with a 17% K-rate. If he can work on putting the ball in play he will rise quickly. Omar Lebron, 1B/OF, Age: 19 — The 19-year-old doubled his home run totals from 2017 making it a grand total of 6 but his K-rate was only 25% which is more of the norm with today’s sluggers. He did have a sharp decline in SB and OBP which lead to his name being left outside of the top 50. Humberto Mejia, RHP, Age: 21 — After missing all of 2017 with an injury he bounced back nicely in 2018. He logged 92.2 innings amassing 59 K’s with a 1.10 WHIP, 3.30 ERA. Alberto Guerrero, RHP, Age: 21 — 2018 saw Guerrero getting more opportunities to start. He started 14 games out of his 15 appearances logging 69.2 innings with 63 K’s, a 1.19 WHIP and a 3.49 ERA. R.J. Peace, RHP, Age: 21 — A 2015 round 13 draft pick, Peace is looking more like a reliever and hopes are that he can be dominate enough to be either a high leverage guy or a swing man. In 34 innings last year he amassed 39 K’s with a 1.32 ERA. C.J. 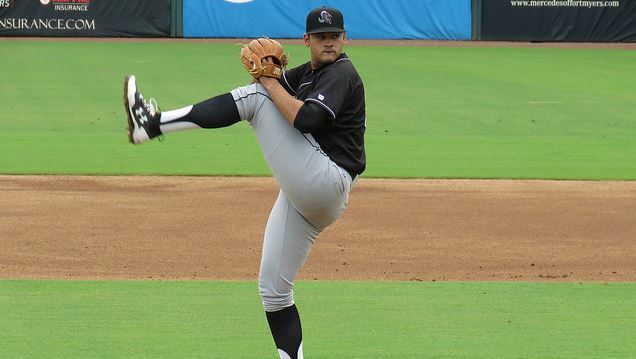 Carter, RHP, Age: 21 — 2018 round 39 draft pick by the Marlins, he appeared in 21 games logging 29.2 innings with a 1.21 WHIP and a 3.64 ERA. He did strikeout 38 in those 29.2 innings which means the Marlins may have gotten a late round steal. Zach Wolf, RHP, Age: 21 — 2018 round 18 pick by the Marlins, he appeared in 19 games logging 21.2 innings with a 1.02 WHIP and a 2.08 ERA with 31 strikeouts. Please comment and let me know who you think deserves a shout out! As always feel free to hit me up on Twitter @stoffer81!